30 March 2019. 93rd Annual Poets' Dinner gave me a win and an honorable mention today. See Winners (navigation to left). 24 February 2019. Arts Benicia's "Art of a Community" closed today with some 30 of us reading our ekphrastic poems. Here’s a Peter Bray photo of part of the audience. Elizabeth Bush’s photo and my poem for it, “Prickly,” are on the More Ekphrastics page, to the left. 15 December 2018. 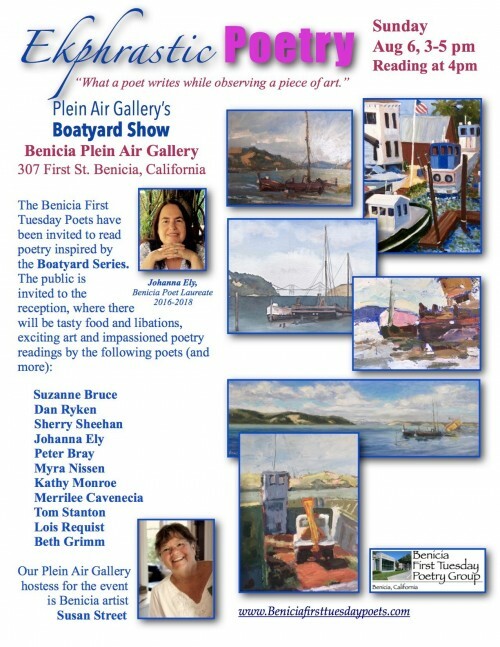 Another fun ekphrastic event in Benicia, this time at Benicia Plein Air Gallery, featuring Samantha McNally. Pasted in is one of my poems for her paintings (click to expand). 3 November 2018. Added two poems to Winners page (navigation to left). where Sara Wong gave me this cupcake cookie for the poem I wrote for her cupcake painting. the Benicia First Tuesday Poets' seventh anthology, "Light and Shadow." 19 November 2017. Another fun ekphrastic event in Benicia. 1 August 2017 Look forward to Sunday, as below. 1 April 2017 Added "Josephine" to Winners page (navigation upper left). 13 February 2017 At Arts Benicia, 991 Tyler St., on Saturday afternoon, 4 February 2017, an ekphrastic reading with 20 Benicia First Tuesday poets for "The Art of a Community" attracted a sizable audience to celebrate many of the 200+ art works at the exhibit. A binder of the 40+ poems we read is on site. The exhibit will remain until Sunday, 19 February, 2017. Hours 12-5, Wednesday-Sunday. 5 November 2016 Ina Coolbrith Circle's 97th annual banquet was fun to read for and win a prize at (third in Humor for "Vicarious Exercise"). Here's a photo of banquet host Connie Post (in black) with readers Deborah Grossman, Stan Morner, Charlie McCauley, and me (behind Stan). 25 September 2016 Thanks to Dr. Jim Ott, yesterday's feature at the Ina Coolbrith Circle meeting, my poem "Escape" landed in the ICC Po-Bowl at http://coolpoetry.org/inthepobowl.html for a month. 12 August 2016 Benicia Plein Air Gallery reception with paintings by all 12 artists, for whom the Benicia First Tuesday poets wrote and delivered their poems. I was happy to see one of my poems published in the 12 August Benicia-Herald. 23 July 2016 Participated in the Nikki Basch Davis Benicia Library exhibit with other First Tuesday poets. 25 June 2016 Benicia First Tuesday Poetry group's sixth anthology, Crossing the Strait, launched at the Benicia Public Library (100+ pages). 8 January 2016 Added Coastal Jewelry to WINNERS page (Navigation to the left). Saturday, October 24th, 2 p.m.
1 August 2015 Enjoyed the reception for "Streets and Straits in Poetry and Paint" at the Benicia Library, where more than a dozen of us read our poems for Benicia Plein Air Gallery artists' paintings on exhibit at the library through August. Here's the poster Peter Bray created for the event. 11 June 2015 Added Mary Reusch's painting "Abode" to MORE EKPHRASTICS with my ekphrastic poem for it, "A Bonnard Bath." 23 May 2015 Enjoyed co-featuring with Deborah Silverman at the Frank Bette Center for the Arts in Alameda. Jeanne Lupton runs a fun venue. 11 April 2015 Added to the WINNERS page (menu to the left). 9 December 2014 "An Exploration of M.A.R.S. : Poems inspired by the Art of Marco Antonio Rosales Shaw" is an anthology of poems by Suzanne Bruce, Susan Condeff, Deborah Fruchey, William Landis, Stan Morner, Indigo Moor, Maria Rosales, Deborah Silverman, Sandra Lee Stillwell, and me. This beautiful 50-page paperback is available at Amazon for less than $10. "Wipe-out," one of my poems in the book, has been added to ANTHOLOGIZED (menu to the left). Welcome to my paperless poArtry and poetry pages. Since composing this Home page in October 2008, I've added more recent updates and a few more pages, clickable under Navigation to the left. For links to more art and poems at other sites, please scroll to the end of this page. This mysterious Santa Fe painting by Michigan artist Mary Reusch provoked a small ekphrastic tribute below. after Mary Reusch's painting, "Inside the Kiva Inner Door, Inner Light"
The dead have not discarded theirs. For my granddaughter Claire's seventh birthday in October 2008, I sent her this poem written when visiting her and her family in Michigan shortly after her birth. I see a row of cypress sway. I hold my infant grandchild, Claire. we sway the same in our cool air. October here is not that hot. that she’s prepared to share. I shift from one leg to the other. Here's a long ago poem I still like. to prod me to action. and soak until I’m human. Published in "Windows & Skylights / Anthology 3 / Benicia First Tuesday Poets (Outskirts Press, Inc., 2010) and in the Benicia Herald on April 26, 2011, as part of its April poetry series. The two poems that follow appeared in the Crockett Signal. exam. "Blue eyes, brown hair"
whose parking lot I'd used. from the cigar he chewed. a painted Holstein looks at me. of her place in the universe. I talk to her through my windshield. Her eyes are meltingly real. I am reassured by her bovinity. I call the latté my medicinal libation. for my upcoming milk and caffeine fix. now disappearing into the distance.